Performers include: Harry Morgan, Jamie Farr, William Christopher, Rosalind Chao, Barbara Townsend, John Chappell, Patrick Cranshaw, David Ackroyd, and Jay O. Sanders. This sitcom picks up where M*A*S*H leaves off, following some of the sitcom’s characters after the end of the Korean war. Colonel Sherman Potter (Harry Morgan) finds that retired life back home in Hannibal, Missouri is not quite what he was expecting. He’s terribly bored so his wife, Mildred (Barbara Townsend, later Ann Pitoniak), suggests that he go back to work. So, Colonel Potter gets a job as Chief of Staff at General Pershing Veteran’s Hospital, being hired by the hospital administrator Mike D’Angelo (John Chappell). Back in Toledo and married to Soon-Lee (Rosalind Chao) from Korea, Max Klinger (Jamie Farr) gets in trouble with the law so Colonel Potter offers him a job as an administrative assistant at the hospital. D’Angelo’s uptight executive secretary, Alma Cox (Brandis Kemp), has it out for the unorthodox veteran while secretary Bonnie Hornbeck (Wendy Schall) is smitten with him. Was AferMASH just a bad idea? Yes, they shouldn't have tried it. No, they just didn't do it right. Father Mulcahy (William Christopher), whose hearing was extremely damaged at the end of the war, becomes very depressed and starts drinking too much. Colonel Potter arranges for surgery to restore his hearing and Father Mulcahy then joins the hospital staff as Chaplain. Also working at General Pershing are a bright but naive resident surgeon named Gene Pfeiffier (Jay O. Sanders) and an absent-minded long-time patient named Bob Scannell (Patrick Cranshaw) who once served with Colonel Potter in World War I. As Soon Lee is about to go into labor, he gets arrested for punching a shady real estate agent and goes to jail. He escapes jail in order to be there for the birth of his child and then feigns insanity to avoid prison. He’s sent to the psychiatric unit at the hospital and is treated by Dr. Lenore Dudziak (Wendy Girard). While Klinger’s “away,” the Potters take in Soon-Lee and the baby. Bureaucratic D’Angelo is transferred to Montana and is replaced as administrator by Wally Wainwright (Peter Michael Goetz) from Washington, D.C. Young Dr. Pfeffier is replaced with Dr. Boyer (David Ackroyd), a brilliant but bitter surgeon who lost a leg in Korea. Still confined to the psych ward, Klinger organizes lotteries revolving around what will be announced over the intercom next. All is going well until Soon-Lee wins the jackpot. Dr. Boyer is showing intern Andy Caldwell (guest Tom Isbell) the ropes when he collapses from an infection in his damaged leg. He’s virtually terrified of being operated on again and is confined to a hospital bed. The doctor becomes even more insufferable than he usually is, until Dr. Dudziak finds his soft spot. First aired: December 4, 1984. There aren’t currently any plans to revive the show. • Though not the last episode aired, “Ward Is Hell” was the last episode produced. It was directed by AfterMASH executive producer Burt Metcalfe, the only producer to stay with M*A*S*H for its entire 11-year run. • The series placed as the 15th most watched series for its first season. The ratings began to fall as time went on and, in season two, the ratings dropped dramatically. The show was put on hiatus for all of November 1984. It returned in December for two episodes and was then pulled again. AfterMASH briefly returned in late May 1985 for one Friday night. 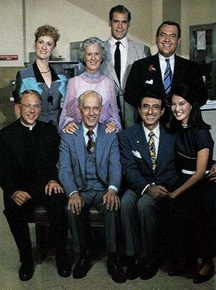 The series was the first of the 1984-85 season to be cancelled and ranked in 90th place for the year. • One episode, titled “Wet Feet,” was scheduled but never aired. It revolves around a poker game that coincides with the preparations for a major storm. • For some reason, many lists of AfterMASH episodes do not include the 20th episode, called “By the Book.” The story centers around Klinger’s and Colonel Potter’s prospecting. Klinger goes looking for uranium while Potter searches for an antibiotic that hasn’t been approved by the VA. The episode first aired on March 5, 1984. • Other than the series regulars, a few M*A*S*H characters appear (Radar and Colonel Flagg) and a few (Hawkeye, Frank Burns, and Dr. Sidney Friedman) are merely mentioned during the show’s two seasons. In one episode, Klinger redecorates Colonel Potter’s office to resemble his office from the 4077th and it includes painted portraits; one of Radar and one of Hawkeye, BJ, Margaret, Winchester, Klinger, and Mulcahy. • After Gary Burghoff appeared in season one of AfterMASH as Walter “Radar” O’Reilly, a half-hour pilot for his own post-M*A*S*H series was filmed. W*A*L*T*E*R was shown as a special presentation on July 17, 1984 and was pre-empted on the West Coast by coverage of the Democratic National Convention. The pilot, directed by The Incredible Hulk’s Bill Bixby, didn’t fare well in the ratings and CBS passed on ordering the series. Are there any plans to release After Mash with bonus episode W*a*L*T*E*R? This was a brand new series!! It was getting good and you cancel it! What are you people doing? Am watching Season 1 episodes online currently. It is nothing near the disaster it’s often called. In fact, most of the vitriol seems to be coming from those who’ve never seen the show. It’s not M*A*S*H* nor was it intended to be. It’s a gentle comedy/drama of life in 1950s rural America. I think I saw ONE episode…..I was Army infantry during the “Vietnam Era” and I was on Korean DMZ – contrary to what you learned in school, the war did NOT end in 1953…guys who lost body parts ( or their lives) are proof there was no “peace” in Korea in the 1970’s. The trouble with “AfterMASH” is that it came across as just another TV sitcom displaying contrived humor. Even with good actors, you need good writing. I have all epiusoes but 3 of Aftemash. Now more ineresting since the plot is a VA hosital you get a lot of mention of every newsworhthy stuff today. Too bad critics said it was bad show. I think it was woderful un. No show could have followed MASH’s plot.